Introduction: Although wide diameter implants are well documented in the literature, little is known about ultra-wide diameter implants (> 6mm). These are intended for immediate placement in molar extraction sockets. The ultra wide diameter facilitates primary stability and ideal placement positioning . 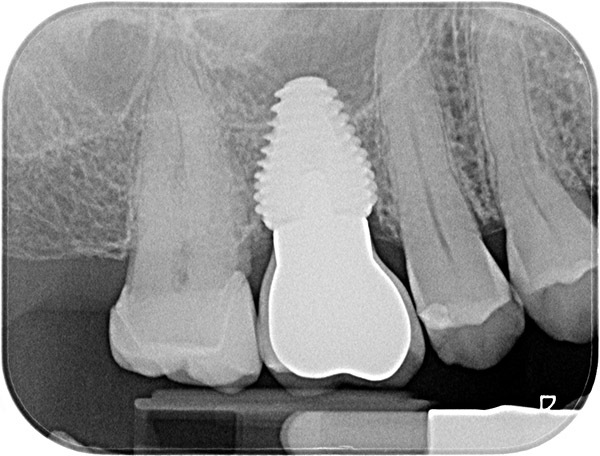 This study evaluates the outcome of ultra-wide diameter implants, placed in molar extraction sockets. Patients were selected and treated by one periodontist for this clinical prospective study. The ultra-wide diameter implants (Max, Southern Implants, Irene, South Africa) were placed immediately after molar extraction in a 1-stage manner and without raising a flap. No bone grafts were used. After 4 months, the implant was loaded with a single screw-retained crown. Bone loss was evaluated using peri-apical radiographs. Plaque and bleeding were also recorded. Crown and papilla dimensions were measured and compared with the contra-lateral tooth. 46 patients (32 male, 14 female), mean age 61 years old (SD 9, range 38 – 89) were treated with a single ultra-wide diameter implant. 23 implants were placed in the maxilla and 23 in the mandible. The implant diameters were 7 mm (#20), 8 mm (#23) and 9 mm (#3). Implant length was 7 mm (#3), 9 mm (#25) and 11 mm (#18). The biotype was considered thin in 1 case, medium in 29 patients and thick in 16 patients. After a mean-follow-up period of 20 months (SD 5, range 11-34), the mean bone loss was 0.89 mm (SD 0.70, range – 0.50 – 3.09). There was no significant difference between the maxilla and the mandible (p=0.150). Also, there was no correlation between the gingival biotype and bone loss (p=682). The mean papilla height at the implant was 2.73 mm (SD 0.85, range 1.00 – 5.00) while at the contra-lateral tooth, mean papilla height was 2.80 (SD 1.19, range 0.00 – 5.00) (p=0.462). There were no differences between the implant crown and contra-lateral tooth in terms of crown length (p=0.140), zenith (p=0.518) and bucco-palatal dimensions (p=0.271). There was, however, a small but significant difference (0.32 mm) in the mesio-distal dimension (p=0.027).Bleeding on probing was reported in 78.2% of the cases. Plaque was present at 45.6% of the implant crowns.